Peel and perfect your skin with The Ordinary Lactic Acid 10% + HA 2%, a high-strength chemical exfoliator that renews and brightens your complexion. For those looking for intensified peeling results, the The Ordinary Lactic Acid 10% + HA 2% uses the powers of alpha hydroxyl acids to encourage radiance and a smoother, more even skin tone. Featuring a high performance blend of lactic acid to promote skin regeneration, hyaluronic acid to plump the skin and Tasmanian pepperberry to calm irritations that are associated with the use of acid peels, this super-powered exfoliator will dissolve away dead skin cells to promote radiance. Suitable to be used every evening, before the use of creams or oils. Please ensure sunscreen is used the morning after every application. If irritation starts, The Ordinary Lactic Acid 10% + HA 2% can be diluted to help build the skin’s tolerance. Not suitable for sensitive, broken or sensitised skin. Free from alcohol, silicone, nuts, cruelty, fragrance, parabens, sulphates, mineral oil, methylchloroisothiazolinone, methylisothiazolinone, animal oils, benzalkonium chloride, coal tar dyes, formaldehyde, mercury, oxybenzon. Vegan. 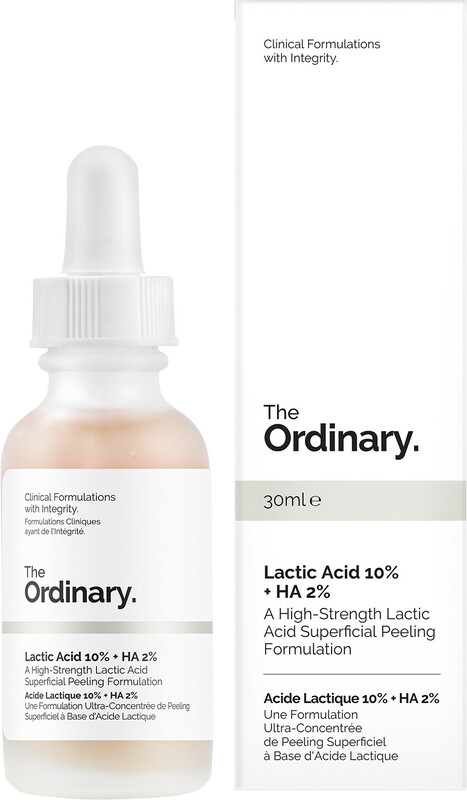 The Ordinary Lactic Acid 10% + HA 2% 30ml is rated 5.0 out of 5 by 6. Rated 5 out of 5 by dijanote from Visible results Excellent product, visible results after few uses. Definitely will buy again. Rated 5 out of 5 by Elle1995 from fading my acne scars and more <3 I LOVE THIS PRODUCT!!! It has been great for my skin and helped fade my acne scars, reduced the appearance of blackheads on my skin and helped the overall brightness of my skin. I have heard on youtube that some people don't like this product however its worked really well for me. Rated 5 out of 5 by Killy from Great product First time buying this product and absolutely love it.......would highly recommend.